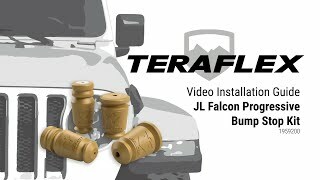 The JL/JLU: Falcon Progressive Front & Rear Bump Stop Kit adds additional protection to your suspension over the factory bump stops, which can deform during hard compression and suspension movement. These bump stops are a full 1.5” longer than stock. Progressive “Foam” Bump Stops are constructed from a performance-tuned high-density closed-cell nitrogen charged microcellular polyurethane technology that will not fade or dissipate under extended heavy use to maintain its progressive nature. This material is unaffected by temperature extremes and retains its flexibility under thermal or sub-zero temperatures. Additionally, these maintenance-free Progressive Bump Stops don’t require any adjustment or tuning. • Direct replacement for factory foam bump stops.